Smart Pond 10 S 2 | Efficient Sonics Ltd. 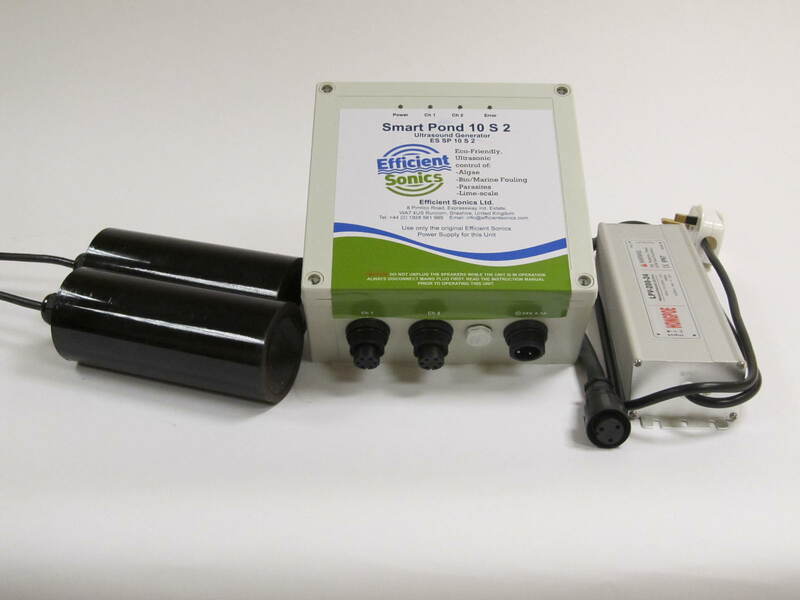 The Smart Pond 10 S 2 is specifically designed to remove existing algae and prevent new algae growth in small ponds. The Smart Pond 10 S 2 has two outputs of 20 Watts and comes with two small transducers giving a range of 2 times 10 metres. This gives multi-directional coverage in the pond and is suitable if obstructions such as water features are present. Included is a 24 Volt Mains Power Supply, Mains ac version: 170 V to 240 V ac, 50 or 60 Hz, or: 100 V to 120 V ac, 60 Hz. The Smart Pond 10 S 2 has the unique Smart Tune Technology, which automatically re-tunes the system for optimum performance every 6 hours, or other interval as requested.